The GOES-17 Solar Ultraviolet Imager, or SUVI, began taking observations on May 16, 2018. 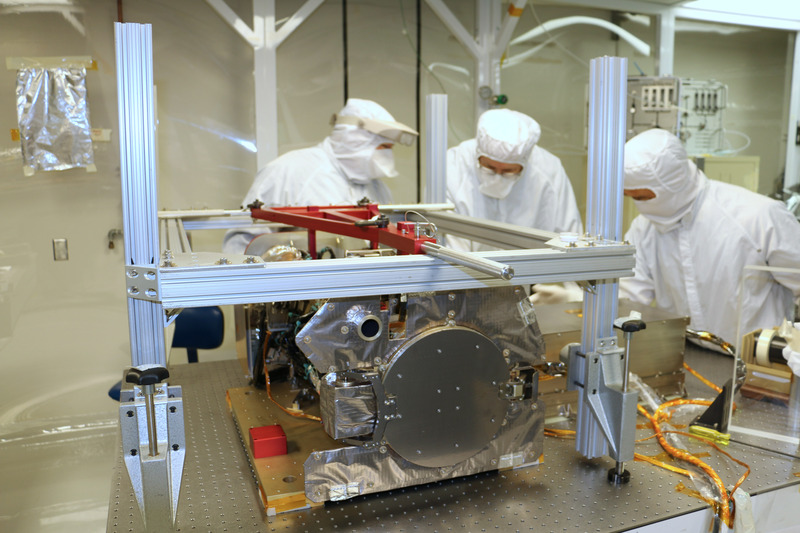 It joins a sister instrument on GOES-16, imaging the sun in the extreme ultraviolet portion of the spectrum. During the low point of the sun’s 11-year activity cycle — which we are approaching now — powerful solar flares and energetic coronal mass ejections become scarce, but they do not disappear entirely. Small flares can happen even during the deepest and quietest parts of the solar cycle, as shown by this moderate C2 class solar flare observed by the GOES-17 SUVI on May 28, 2018. Although these flares inject the equivalent energy of hundreds of thousands of nuclear explosions into the sun’s atmosphere, they do not generally have much impact on space weather near Earth. The flare is seen in the SUVI images as the bright active region in the top left quadrant of the sun. Despite the approaching solar minimum, the GOES-16 SUVI did capture some of the most powerful flares ever observed in September 2017. GOES-17 has the same capabilities. SUVI observes the sun’s atmosphere, or solar corona, which consists of extremely hot plasma, a super-hot ionized gas. This plasma interacts with the sun’s powerful magnetic field, generating bright loops of material that can be heated to millions of degrees. These include cool, dark regions called filaments, powerful and dramatic outbursts of activity called solar flares, and coronal holes. Coronal holes, one of which can be seen directly below the bright flaring region in the GOES-17 images, are regions where the sun’s magnetic field allows plasma to stream away from the sun at high speed, which we call the solar wind. This process leads to a darkened region in the corona — the coronal hole — and the potential for high speed streams of charged particles in the solar wind to envelop the Earth, which can lead to unsettled space weather. During periods of low solar activity, coronal holes are often the dominant drivers of space weather. All of these phenomena are so hot, we observe them not with ordinary visible light, but with X-ray and extreme ultraviolet (EUV) cameras. Various chemical elements emit light at specific EUV and X-ray wavelengths depending on their temperature, so by observing in several different wavelengths we can get a picture of the complete temperature structure of the corona. The GOES-17 SUVI observes the sun in six EUV channels. Flares are seen in the hottest channels (94 and 131 Å), which show plasma up to ten million degrees. Active regions are seen (like the one on the right limb, or edge, of the sun) when plasma is near one million degrees (171, 195, and 284 Å), and filaments in temperatures closer to 50,000 degrees (304 Å). Filaments and active regions sometimes produce eruptions, hurtling huge tangled clouds of plasma and magnetic field out into the solar system, and are known as coronal mass ejections. These outbursts are much more energetic than streams of the solar wind, and they can induce major space weather effects near Earth. Large eruptions of this nature are rare during solar minimum, but they are one of the biggest space weather threats during periods of solar activity. Depending on the size and the trajectory of solar eruptions, the possible effects to near-Earth space and Earth’s magnetosphere can cause geomagnetic storms which disrupt power utilities, communication and navigation systems, and may cause radiation damage to orbiting satellites and the International Space Station. The effects linked to coronal holes are generally milder than those of coronal mass ejections, but they still pose risks to satellites and astronauts in orbit around the Earth. One of SUVI’s distinguishing characteristics is its large field of view, which will allow NOAA scientists to observe distinctive features of the corona out to distances rarely observed in the EUV.